The sun is shining, the birds are chirping and the temperatures are slowly but surely on the rise. What does this mean??? It means that salad season is upon us and it's time to fully bust out that grill. This recipe allows for both grilling and enjoying the freshness of summer vegetables. I can't wait to discover more fun summer salad recipes this season. Trim any fat from the sirloin and cut into the 3/4 inch thick slices. Place meat in a large zip-lock bag. In a small bowl, whisk together vinaigrette salad dressing, spreadable jam, cilantro and chipotle peppers. Pour 1/2 cup of the vinaigrette mixture over the meat. Cover the rest of the vinaigrette and keep in the fridge until ready for serving. Place meat in the fridge to marinade for at least 1 hour, but even better if you can marinade for 6 hours or overnight. 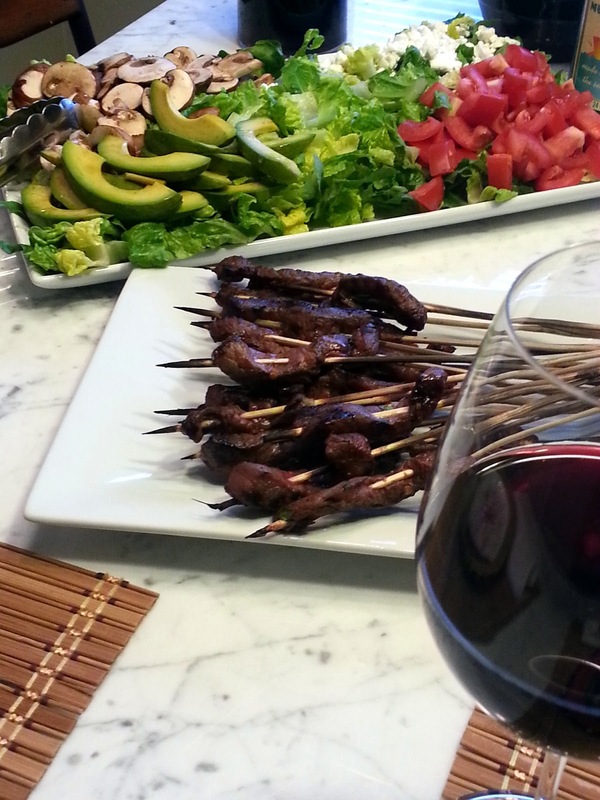 Soak bamboo skewers for 30 minutes before grilling. Start the grill to medium direct heat for grilling. Drain the marinade and skewer the sirloin strips on the skewers. Grill the skewers for 4-6 minutes. Serve right away after steak is done cooking. Arrange salad anyway you would like for serving, place steak on top or on the side and have the remaining spicy raspberry vinaigrette mixture for dressing the salad. *Recipe is adaptation of recipe from Midwest Living February 2013 magazine.